Caption slip reads: "Photographer: Gaze. Date: 1957-12-03. Reporter: Gaze. Assignment: Guy murder trial. 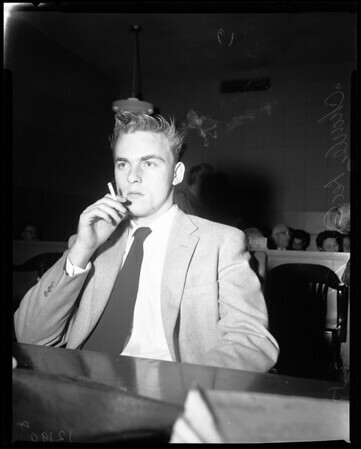 #61-62: Charles Lee Guy, III, 19, in a moment of relaxation before the long wait after the jury started its deliberations which eventually will result in his getting the gas chamber, prison sentence -- or, his freedom. #77-78: Deputy Sheriff Fred Irvine and Guy Chas. Lee Guy III, 19, in drab Santa Monica jail cell awaits verdict".